Why move to ‘no-dig’ allotment gardening? The experience on the allotment this winter has been very different compared to last year. The weather has been relatively kind which has helped, but what’s paid off is the work I carried out on the allotment following the waterlogging 12 months ago. It’s allowed for me to have a more pleasurable, gentle period as I simply shape and maintain the plot. I’ve enjoyed a rather relaxed time on the allotment over the past few months. Keeping an eye on the water levels, pulling the odd weed from the beds and planting garlic. Unlike previous years, I feel ready for the spring and not rushed to get on top of the beds and paths so not miss the first sowings of the year. The extra time has also allowed me to sit back and read the books, blogs and other material I’ve had on my list for some time and the luxury to think and consider my plans for the forthcoming season. Ever since I began allotment gardening, I have performed what I have been led to believe is the right way of doing things. Hard digging, turning the soil, mixing in the manure and compost. I’ve said before that I don’t necessarily dislike this process. However, let’s be truthful here. It’s hard work. It’s time-consuming and I must admit, the effort put in makes it demoralising when those weeds appear over that nice looking soil – as quick as you can say ‘hello spring’. The work I’ve done on the allotment, digging out the path network and raising the beds has worked. I don’t think there was a better way to solve the levels of water we face on the plots. I’m impressed by the conditions on the allotment and really pleased I’ve got a handle on the problem. However, having turned the plot around and resolved these issues, I now have the opportunity to adopt an approach to allotment gardening that makes it as enjoyable as I know it can be. As I say in my about page, I genuinely believe it possible and hugely beneficial to manage an allotment despite the daily working life. If I want to demonstrate that and hopefully inspire others to do the same, I have to ensure the approach I take on the allotment lives up to that statement. No-dig gardening isn’t new. Although the origins of the approach aren’t clear, it’s an approach that has developed over at least the last century. Ever since I began allotment gardening, I’ve always been aware of the no-dig approach but until recently I hadn’t given it much thought. Like many, the traditional methods of gardening were the automatic route taken because it has become ingrained as the ‘right’ way to do it. This behaviour of becoming fixed in a way of doing something because it has always been done in that way is true in many areas. James Robbins has again provided a timely blog post articulating this and the concept of a paradigm shift. It’s worth a read. I consider myself a rational person. I like to explore subjects, read and absorb them, understand them and make judgements when I have had the opportunity to digest the information. Over the past few months, I have found myself doing just that. Having known of Charles Dowding and his inspiring work and commitment to no-dig methods for a long time, it was the perfect place to start. I bought Charles’s books and devoured them one after another. I’ve also spent time watching and listening to him speak and demonstrate his approach through the videos available on his website and YouTube channel. Two things struck me as I did this. The first is how brilliant and passionate (not dogmatic) a communicator Charles is on the no-dig approach to gardening. Secondly, how much sense it makes. Not only are the methods used by Charles simple, they bloomin’ well work magnificently too. Seriously, if you haven’t seen Charles’ vegetable gardens, take a look at the video below – I’m sure it will make you as envious as it made me and also inspire you to consider his approach. I can’t recommend Charles’ written works enough. The transition in my way of thinking and approach to allotment gardening was immediate. Every excuse for not adopting the methods was quashed in the short period of time I’ve spent reading his books and watching his informational videos. If you have read my blogs, you may notice I like to take the time to understand a subject – even if it’s just on one particular vegetable. I write the way I do not just to present the information to others, but to support my own understanding. I write because it helps me learn and clarify my thoughts. As a result, I didn’t stop with Charles Dowding. I looked for more and more. One discovery was a book by Jean-Martin Fortier called The Market Gardener. Many claim it is the most influential farming book of the last decade. It has now sold over 70,000 copies as well as winning numerous awards including the 2015 American Horticultural Society Book Award. Jean-Martin and his wife Maude-Hélène are founders of Les Jardins de la Grelinette, an internationally recognised 10-acre micro-farm in Quebec, Canada. The focus at La Grelinette has been to grow better, not bigger, making it more lucrative and viable in the process. Their farming practices demonstrate how small-scale farms, using regenerative and economically efficient agricultural practices, can produce a higher nutritional quality of food and more profitable farms. Although the terminology is sometimes different, the methods are equivalent to organic, no-dig practices publicised by the likes of Dowding. The book and their website are targeted at micro-farmers who wish to adopt environmentally sustainable and financially viable businesses, however, the knowledge and techniques are universally practical – even for the ‘grow your own veg’ allotment holder. Each book, website and video led me further and further into this adventure. More information to consume and understand. More thinking and more weight adding to my change in direction. Many gardeners are already utilising these methods – some like Mick Poultney having been growing veg this way for 20+ years. One of my favourite YouTube channels on this subject is Raf’s Kitchen Garden. I enjoy watching Raf’s videos because like me he is learning, sharing this knowledge and demonstrating how it works in his own allotment. As a viewer, this is the best way to understand a subject and see how theory is put into practice by people just like you or me. 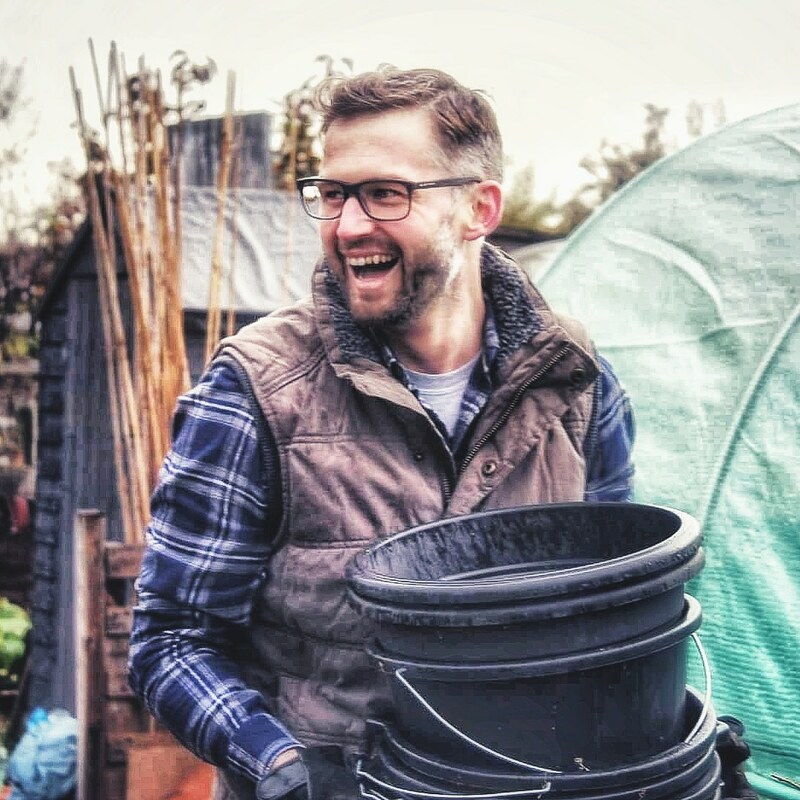 Raf works full time and usually has only the weekends to spend at the allotment – this is relatable. What he achieved as a new gardener in his first year, using organic, no-dig methods is truly incredible. I strongly recommend you watch his videos in chronological order and see for yourselves how he took an overgrown allotment from a state of neglect to a plot that provided an abundance of fruit and veg. Reading Charles Dowding’s books, you soon realise that no-dig is an approach to gardening that is much more than not using a spade to turn the soil each year. It is a wide-ranging methodology that utilises sustainability and natural processes that deliver both environmentally and resource efficient practices to growing fruit and vegetables. Charles is also a rationale individual. The methods he advocates are not plucked from the air. The hardest part of accepting his gardening approach is having to force yourself away from a preconceived method of gardening and remain objective and open minded to properly consider what it is he is saying and demonstrating through his results. I love that Charles is in a constant state of experimentation. It has been a persistent element in his gardening for over twenty years. Not only is he clear in asserting the results that work, but he is honest in those that do not or make little difference. Also, despite demonstrable, underlying principles of no-dig gardening, you are expected to trail and experiment in your own gardening to discover the best approach for your own individual circumstances. In essence, no-dig is about undisturbed soil structure. It is a living organism, which when healthy is filled with significant amounts of desirables that enable our growing vegetables to flourish. The process of maintaining this is by not destroying the structure through digging and turning the soil but by feeding its environment through continual mulching on the surface with organic matter. Even on heavy clay soil, the result of this process is remarkable– Charles knows, as he has clay soil in his own garden. However, by reading his books you learn so much more. How to provide the wonderful organic matter that delivers this wondrous environment for producing strong and healthy plants. How to manage pests such as slugs, by understanding their role in the garden and ensuring the plants placed in the soil are already on the front foot by raising them under cover to ensure strong and healthy specimens. Also, through Charles’ experience, you are prepped, quite specifically, with the best times to sow, plant and harvest the entire range of fruit and vegetables for the season and ensure you harvest the entire year. This then is a new approach for me and I have much to learn. However, I am jumping with excitement to move in this direction. Understanding the principles provides me with the confidence that growing veg this way will be successful. There is also sheer enthusiasm to experiment and learn with freedom, as Charles encourages, to find the right methods for my own plot. I guess it leaves one elephant in the room – the name of my blog. Well, I’ve considered this too. Even Charles requires a spade sometimes to get the monster parsnips he grows out of the ground! Failing that, I’ve decided that if this is my future approach to allotment gardening, then in a while I will pretend the name of my blog was simply a result of inspired, creative irony. I am aware that some of you already adopt a no-dig approach. I’d love to hear your experiences. Drop me a comment below or get in touch through my Facebook or Twitter. Next No plot? No problem – Growing your own in a small space. Even if you never dig a single thing ever again, you’ll still need a sharp spade! If nothing else there’ll be the chopping up of stuff before you add it to the compost heap. You may, though, need to think about your tagline; perhaps “Forking about for victory …..”. And anyhow, the sage advice about always keeping your spade sharp has never been tempered with “Unless you don’t use it!” I wonder, has anyone ever compared the average weight/fitness of dig versus no-dig gardeners? Looking forward to the next instalment (and waiting for the return of the chair). I’m with you on the transitioning. I have the luxury of setting up a new polytunnel with three long raised beds, built using the hugelkulter method and they will be no-dig. I have a number of beds with permanent plantings so they are no-dig by default. The thing I’m having trouble getting my paradigm around is bindweed; that stuff just laughs at cardboard and a 15 cm mulch. Ask my asparagus bed ;/ I think I may become a no-dig digger! I think it’s one if those perennial weeds that needs to be dug out as much as possible. I struggled with bindweed on previous plot. Hopefully it will weaken the more you work on it. Hi Hugh. Thanks so much. I found it difficult to stop writing. Looking forward to this new adventure. Will certainly have much to say. I first came across no-dig about 14 years ago with my first allotment that I shared with a friend. She knew about permaculture and came across it there. We decided to give no-dig & raised beds a go, and have never looked back. To me, one of the wonderful things about gardening is the experimentation. I love reading Charles’s posts on his experiments comparing dig with no-dig – the detail is always fascinating. I’ve not come across The Market Gardener before and will look that up. Sounds very interesting. I recommend back to you, if you’ve not already come across it, The Earth Care Manual by Patrick Whitefield. It goes into more detail about soil etc and permaculture in general. Useful for seeing the interconnectedness of what you do, in the house, garden and further afield. Good luck with your no-dig adventure. I suspect in a couple of years you’ll look back and wonder why you ever thought digging over your plot every year was a good idea! Yes I think I will certainly agree. Just grasping the concepts and seeing how successful it can be from others, it makes a huge amount to sense to transition. There’s so much on this topic. I try to keep my rational head on when I read material. What I enjoyed about the market gardener was, like Charles I guess, they use this approach on a scale beyond the back yard gardener and make it work successfully. I admit, a lot of the heavy biodynamic stuff is pseudoscience. The organic no-dig principles are very much a proven process. Charles himself demonstrates that when compared directly with dug beds, the crop Harvests are very similar. What I realise is no-dig methodology is a cumulative approach. Constantly bringing improved health to the soil. The immediate advantage is the resource required to manage the garden in this way. Low weed levels and strong plants at the start is where the impact is. Great read, thank you for sharing. We have several of Charles Dowdings books and have watched many of his youtube videos – I envy his weed free beds! We are trying no dig, but are often tempted to dig just a little! Trying to change this mindset is tricky, but we’ll get there! We are lucky to have compost and well rotted manure coming out of our ears! I’m really hoping it starts having an impact on our terrible weed problem fairly soon. Hi Claire. Thank you. Glad you enjoyed this. It’s difficult isn’t it. Breaking with something that appears so normal. What kind of weeds are appearing? Annual or perennial? You might be helping those weeds with that little digging. Bringing the weed seeds back to the surface. Possible? Have you tried putting a thicker mulch of compost? I have watched many of charles’ videos since becoming a plot owner and I have had great success in regards to weed numbers since deciding to go no dig. I’m doing a trial of square foot gardening this year to see if the 2 methods are compatible. Enjoyed reading your blog. Keep up the updates!